Suspect that you or someone you know may have bed bugs (Cimex Lectularius)? Once largely limited to third world/developing countries, the number of reported bed bug infestations in metropolitan areas continue to rise. They present no immediate danger of disease, although bites can cause an allergic reaction. Widespread uses of DDT Insecticide proved very effective in controlling this and other insects. A little too effective, it seems. The USA banned DDT in 1972, after the EPA determined that it contributed to the thinning of egg shells, among other concerns including a possible reproductive and cancer risks in humans. Shortly after, the Stockholm Convention banned worldwide agricultural use. Increased International travel to and from poorer underdeveloped countries, blamed in large part to the re-emergence of this pest. Becoming more of a problem in Hotels, Motels, Hostels and Apartment buildings, common locations for transient residents. As more people switch away from insecticide sprays and use targeted methods such as bait traps and glue traps, insects which avoid these live to breed and reproduce virtually unchecked. C. Lectularius, attracted by the carbon dioxide we exhale, can easily find us in the dark! 1. Noticing small itchy-red-raised bite marks or dried blood droplets in a straight line? These likely indicate bed bugs have fed on you in your sleep. Unlike Mosquito bites, which have no pattern to them, bed bug bites appear uniform and deliberate. If you wake up with these, make time to investigate further. 2. Look for small reddish-brown stains, or black pellets about half the size of a short grain of rice. You might find them on bed linens, caught in the seams of the mattress and box springs, on the wall next to the bed or on paper in a bedside trash bin. During daylight hours, you might find only the molted exoskeletons they shed and left behind. They will also inhabit other furniture such as a couch or a recliner. Have you found signs of Bed Bug waste? 3. Look closely for these very small parasitic insects. You may actually find a bug or two, while tearing your rack apart, but have you found the real deal? 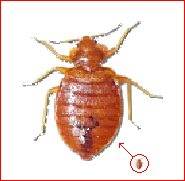 Bed bugs look like very small, flat, oval, wingless insects. Adults mature to about 1/8 inch long, with six legs and antenna. Adult females, larger than their male counterparts, lay 1-5 eggs per day and secure them to surfaces using a sticky secreted substance. C. Lectularius range in color from nearly white as juveniles to reddish brown as adults. They come out to feed on blood at night and in the early morning hours. If you see bugs that match this description, yes indeed, you have Bed Bugs! 4. Build a simple trap to attract and kill bed bugs. It won't trap ALL of them, but enough for you to quickly tell if you have a problem worth hiring a professional for extermination. Using a glove or a pair of tongs, carefully set a chunk of dry ice (frozen carbon dioxide) in a small jar lid placed upside down in the center of a large glue trap. Place this next to or under a bed or upholstered furniture in a darkened room for at least an hour. 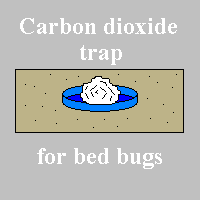 The carbon dioxide will attract bed bugs to the glue trap, if present. With any luck, you will find them either frozen to death or stuck to the glue trap. * Many Grocery stores now sell dry ice in preparation for power outages. * For an effective, long-term, non-toxic treatment, try Diatomaceous Earth. Talcum powder soft to you but sharp as shards of broken glass to them. * A large infestation of Bed Bugs will often give off a sickly sweet odor. * Next time you check into a room, place your belongings in the bath tub or on top of a table and search for tell-tale signs of Bed Bugs, before setting anything down on the carpet, upholstery or bedding. * If you just stayed in a bed bug infested Hotel/Motel/Hostel room, seal your clothes in black garbage bags; placing them inside of a car with the windows closed. Bed Bugs and their eggs will die when exposed to temperatures above 115°F (46°C). A couple of hours in the high heat of the sun will kill all of them. Wash and wear as normal, afterwards. * Dry ice is extremely cold and can instantly cause severe freeze burns to bare skin. Wear gloves or use tongs! * If you hire someone to clean your house, have them use your vacuum cleaner instead of their own. Bed Bugs can travel from place to place inside of them. * If you Manage a Hotel, Motel or Apartment Complex, hire a Professional Exterminator!